My whole family (and a fair number of friends) used it too and it worked for us all. I’ve personally used up countless tubes of it. Although the transparent (white) formula made me oily I stuck to the anti-dullness (purple) formula which did not. 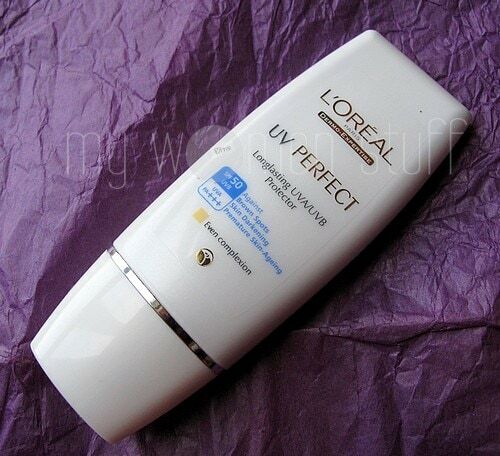 So, when L’oreal dropped off the UV Perfect Long Lasting Protector, I had a feeling of deja vu. What’s different about it? 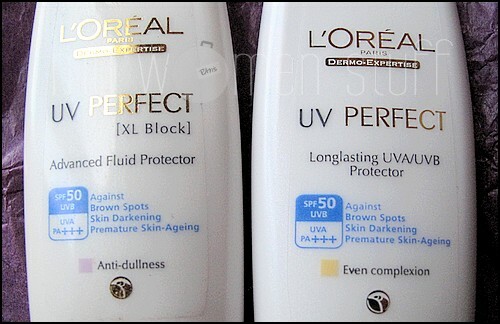 Here’s the new L’Oreal UV Perfect Long Lasting sunscreen set side by side with the UV Perfect Fluid Protector. Barring the name, everything else is identical. I experienced no trouble with this new formula. Similar to the old one, I had no breakouts, I did not get super oily and it keeps my skin burn free. The new formula I have is slightly tinted – Even Complexion. I have a confession. I dislike tinted moisturizer and tinted sunscreen. I never feel like I’ve put enough on my skin as I’m worried it’d look too thick and cakey. However, the texture of UV Perfect Even Complexion is light and it did not look cakey – sheers out to nothing really except a very very slight evening of skin tone. It makes a great makeup base for me and I sometimes just apply loose or pressed powder over it when I’m feeling a little lazy on weekends. Applied under powder foundation, it does help with coverage. On its own, unless you have very good skin, it does nothing for coverage. I don’t know if the new transparent formula makes me oily – the old one did which is why I went off it after a while. I’d not been using the UV Perfect sunscreen for a while but I’ve found that the L’Oreal patented Mexoryl chemical blocker works well for me. I veered off to using Tinosorb S under Eucerin White Solution for a while, but I’ve come back to the Mexoryl fold in Vichy UV Activ sunscreen and La Roche Porsay Anthelios XL. Disclosure: The product featured was a Press sample. My opinion is never compromised. To know my posting policy, please read my disclaimer. I love how light it is on the skin too! I don’t find it oily. But it does breaks me out. And this breaks my heart, because I really wish I could use it. Nevertheless, I picked up a bottle of this during Watsons 20% + 20% promotion for it. Intend to give it another chance, and if it still doesn’t works, no problem, cos it’s such a wonderful product I can pass it to someone else. I just bought this product. So I am currently testing it. It does makes my face slightly oily. Hopefully this product works for me because I have been looking for a good sunscreen. Are you using it in Even Complexion too? I do find that the Transparent or White formula does make the skin oily. i always try to stay away from using sunscreen because they all made my skin oily and breakout. i also hate their smell… if i do go to the beach and all, then i’d use babyblock. this is bad, i know… but i just hate that extra slicky feel on my already oily skin. prime candidate for skin cancer. no? Do you still need to apply moisturizer with this sunscreen? They say you can use it on its own as moisturizer as well. I however always use sunscreen over moisturizer. Its a personal choice as I don’t feel the sunscreen is moisturizing enough. I rarely use sunscreen as in the product. Haha. For a time, mum thought that I would be allergic to SPF because she was too (we are almost allergic to everything), but I lucked out. However, I use BB Creams and Foundations with SPF, especially titanium dioxide, do these count? But SPF isn’t an ingredient, you shouldn’t worry about it! I tried the anti dullness purple one in the old formula and it made me look like an oil slick! i therefore started using it on my body so i can’t say if it really works to keep me burn free. Haha… Yeah being turned into an oil slick is a common lament with this sunscreen. In fact, its always either that it works, or that its oily and breaks the person out. Nothing in between. I like this! Been using the Even Complexion version pretty much every day since I finished my PTR sunblock. Like you, I don’t like tinted moisturisers, and this certainly feels like one. But I try to ignore it, it doesn’t make my skin oily, and keeps it pretty even toned. do u reapply sunscreen? how? i have PTR mineral sunscreen spf30 with brush and powder foundie spf25 , but i doubt its protection as good as cream/liquid one. It’s summer right now in Melbourne and by the time I finish work at about 5pm, the sun is still ever so bright so yes, I do reapply sunscreen. If you ask PB, I usually make a disappearance everyday at about 430 for about 10 minutes to the ladies. I’m armed with facial cleansing wipes, tissues, serum, eyecream, moisturiser, sunscreen and some light makeup. So you can tell I do almost the full cleansing. Facial wipes, then rinse, tissue to pat dry. Serum, eyecream, moisturiser and then sunscreen. I use some light powder for undereyes and blush to highlight and I’m back at my desk. oddly enough, this one got oily on my dry skin. Passed it on to my mom and she’s liking it so far! I used the older formula before (the white one) and it broke me out. But that could be because I wasn’t double cleansing at night? I would love to try it again since it is so much cheaper than my current sunscreen from L’Occitane. The price is as stated in the review. It is easily available at most L’Oreal counters at pharmacies or supermarkets etc. Apply sunscreen last after all your usual skincare. 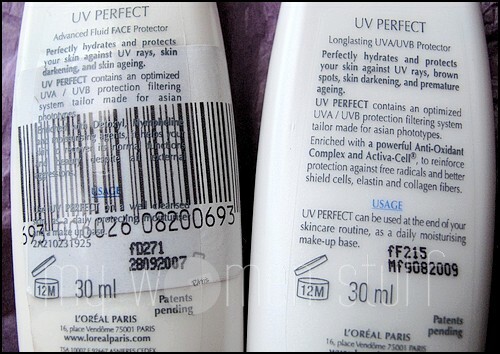 Some have complained that this L’Oreal sunscreen may be a little oily on their skin. Otherwise try other sunscreens out there. You can read all sunscreen reviews here. I’m not sure what you mean by “harm”. Different people have different experiences with this product. Some break out, some don’t and its hard to say if you will. A moisturizer is helpful because I don’t personally think the sunscreen sufficiently moisturizing but if you find it sufficient, then a moisturiser isn’t necessary.